Megabat returns, this time with a new nemesis: a very fancy cat. Can our tiny bat hero stop his Daniel's heart from being stolen by this nefarious, fluffy villain? Megabat was looking forward to Christmas morning: presents, playing toys, smooshfruit and watching Star Wars. But then Daniel opened his last, most special present. Daniel thinks this might be the best Christmas present yet: a beautiful cat named Priscilla! He's always wanted a pet. Megabat is not sure he likes this cat. She tastes most hairy. Daniel loves his new cat! She's fun to play with, and she's so soft and fluffy. Megabat is not soft OR fluffy. He's not purebred and he doesn't have a big, beautiful swishy tail. What if Daniel loves Priscilla more than Megabat? This is truly a disturbance in the Force. Megabat and Birdgirl must find a way to get rid of this trubble cat once and for all! Calamity ensues as Megabat and Birdgirl try to come up with ways to get rid of Priscilla. But is there more than meets the eye with this furry menace? 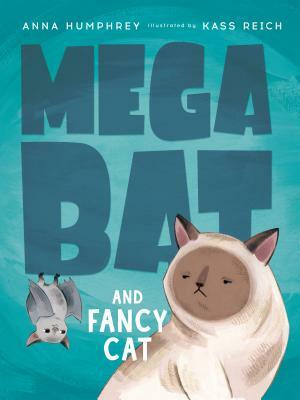 Kass Reich's adorable illustrations paired with Anna Humphrey's hilarious text make for another unforgettable Megabat adventure. ANNA HUMPHREY has worked in marketing for a poetry organization, in communications for the Girl Guides of Canada, as an editor for a webzine, as an intern at a decorating magazine and for the government. None of those was quite right, so she started her own freelance writing and editing business on top of writing for kids and teens. She lives in a big, old brick house in Kitchener, Ontario, with her husband and two kids and no bats. Yet. KASS REICH was born in Montreal, Quebec. She works as an artist and educator and has spent the majority of the last decade traveling and living abroad. She now finds herself back in Canada, but this time in Toronto. Kass loves illustrating books for all ages, including Carson Crosses Canada, Hamsters Holding Hands and Dr. Coo and the Pigeon Protest. This is her second book about a bat.